Plot: After young Riley is uprooted from her Midwest life and moved to San Francisco, her emotions - Joy, Fear, Anger, Disgust and Sadness - conflict on how best to navigate a new city, house, and school. Starring: Amy Poehler, Phyllis Smith, Richard Kind, Bill Hader. 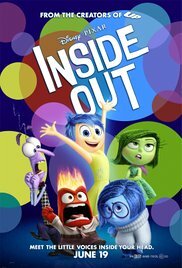 distributed by Buena Vista «Inside Out» in the US movie theaters released on June 19, 2015 and has grossed over $858 million worldwide; dvd and blu-ray release date was set for November 3, 2015. Rent from Netflix and Redbox from November 3, 2015. «Inside Out» in the UK released in movie theaters on July 24, 2015. The movie released on dvd and blu-ray on November 23, 2015.